I was hungry for something a little different tonight, but I didn't want to spend an hour in the kitchen. Twelve minutes sounded better, minus the time it took to photograph what you see here. Since my morning and afternoon meals were high on the protein side, I thought I would balance things with some greener fare. I also wanted something with a mild heat to offset the chill from the frigid temperatures. 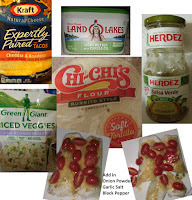 Taking a quick look at the goodies I purchased at Hy-Vee the last time I was there, I came up with stuffed riced veggie wraps with cheese. I cooked the riced veggies in the microwave, as directed on the package. While those were cooking, I spread butter on two tortillas, about a tablespoon each, sprinkled them with garlic salt, black pepper, and onion powder. Next, I sprinkled them lightly with some of the shredded cheese. When the veggies were done, I placed two to three tablespoons of the riced veggies onto each tortilla and rolled them up. I sprinkled the tops with more of the shredded cheese and put them back into the microwave for about a minute and a half. When they came out, I topped them with the Verde salsa and the sliced cherub tomatoes. Pretty simple, really. This combination makes excellent veggie cheese wraps. I was tempted to use pepper jack cheese inside, and I may do that in the future, for a little added spice. I may also used fresh diced onion and some diced red bell pepper to the inside, just for some additional flavor. But, as prepared, these weren't lacking flavor at all. You could change up the spices, too. The riced veggies will go with just about anything. You could also 'beef' this up with some protein, like Tyson's chicken or steak strips, or Tyson's shredded premium chicken breast meat in pouches (Bought the pouches at Walmart). I think next time, for some crunch, I'll put the filled burritos into the cast iron skillet for a minute or two, rather than the microwave. Crunchy is good. Note: I am not an affiliate of these product manufacturers or retailers. Just wrapping things up into a neat little meal for others to enjoy.